You know that old but true saying: ‘Whether you think you can or whether you think you can’t, you’re right’. Martial artist, author and youthist Peter Ragnar challenges many of our core beliefs. And it is these beliefs which create our lives, for better or for worse. 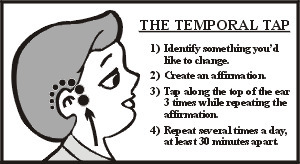 I have used affirmations first thing in the morning since the mid-90s, smiling in the mirror and tapping. Temporal tapping temporarily bypasses the part of the brain that filters words and ideas based on past conditioning, allowing us to re-programme and thereby create new and more fulfilling, exciting futures. Affirmations are powerful tools to help the subconscious mind and spirit focus on the positive effects we are trying to manifest. Affirmations also help to negate our negative self-talk. Check out the following affirmations from Peter Ragnar and see if you can bring about the impossible in your life. As a four-year-old boy once told me: ‘Anything is possible’. I am this instant the rightful recipient of my divine desire! I am the creator of my world and my words are my tools! I am creative energy flowing forth expressing manifestation! My mind owns my body and I own my mind! I am the desire of ETERNAL youth made manifest in my flesh! Luminous health and glorious goodness love me! Money, like a puppy, follows me wherever I go! WONDERFUL things always happen to me; therefore, I always expect WONDERFUL things to happen! Consciousness seeks its PERFECT expression through me! I am the pulsation of creation in the manifestation of an IMMORTAL body with a PERFECT mind! I am the PERFECT expression of gratitude! I am the PERFECT expression of forgiveness! I am the PERFECT expression of love! I am ETERNAL health, ETERNAL life, and ETERNAL wisdom! I am INVINCIBLE in my powers of creation! I am the manifestation of my own idea! My mind power, willpower, and imagination serve to create my OPULENT reality!